“I’m a 39-year-old mother of three in South Carolina and a self-taught artist. My first formal painting class was in 2001 at the Greenville County Museum of Art. Then, I learned basics of composition in a photography workshop at the Gibbes Museum in Charleston. I enjoyed taking unusual photos, and I painted sporadically since then, with a long break after my kids. Recently, I picked up my brushes again. My inspiration is nature. I paint as I view my surroundings. Usually, I will choose an element from nature and hyper-focus on detail with an inconsequential background, although I have dabbled in landscape painting. “Right away, I notice how wonderfully the blue and red complement one another in this image. The pose of the two birds also complement each other as although they are not the same bird, they do hold a lot of similar physical characteristics, almost creating this very cool mirroring effect. 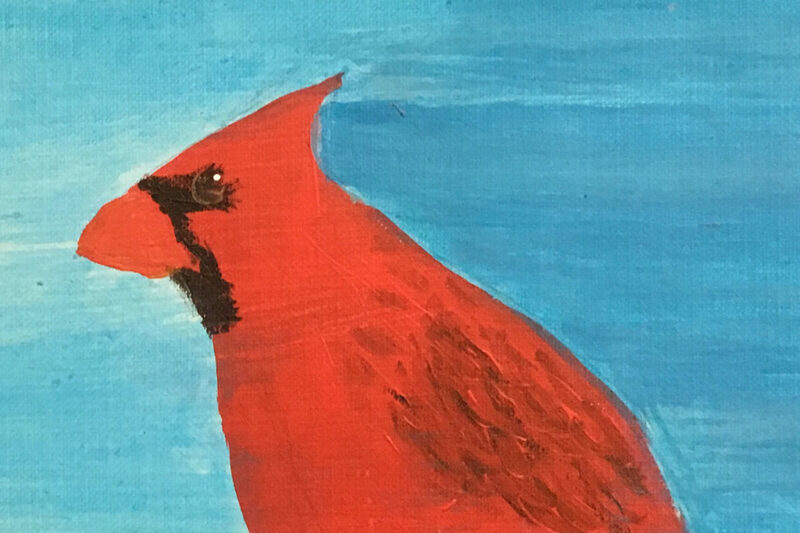 I’m really enjoying how the red bird is leaning in towards the other one ever so slightly, that pose along with along with its big marbley eye, read as if it’s a very curious bird, which gives this piece a lot of character. I really feel an interaction happening between the two of them. I would love to see you explore more with complementary colors and shadows. Explore how warmer tones in the blue bird may give it a better sense of volume and increase the effect of shadows and vice versa with the red bird. 4 responses on "Kate Churches"
There’s some really nice brushwork going on in this painting. You strike an effective balance throughout between areas of detailed specificity and moments of true simplicity. I’m particularly drawn to the head of the cardinal, where the silhouette is rendered in a really crisp, graphic way, while the black patterning on its face is also very simple, but expressed with a more painterly mark. On top of all of that, the fine detail in the eye really brings it together – that little white highlight is exquisite! I also love the element of the mirroring profiles, which does a great job of setting us up to read comparisons in the birds’ shapes. It’s certainly a confrontational pose, but to be honest I don’t read your concept in the image, alone. I admire that you’ve taken on this topic and are trying to express it in a subtle way, but you might need to give us a little bit more to clue us in… To my eyes, although it’s present in the relationship between the birds, their placement within the frame could be revised to amplify that tension. This concept might require you to do a whole series to communicate it properly – but based on this start I think you’re up for the challenge! I am so pleased to hear about your constructive reaction to the election, and your use of metaphor and humanization to tackle this delicate subject. I think your concept was really well handled! 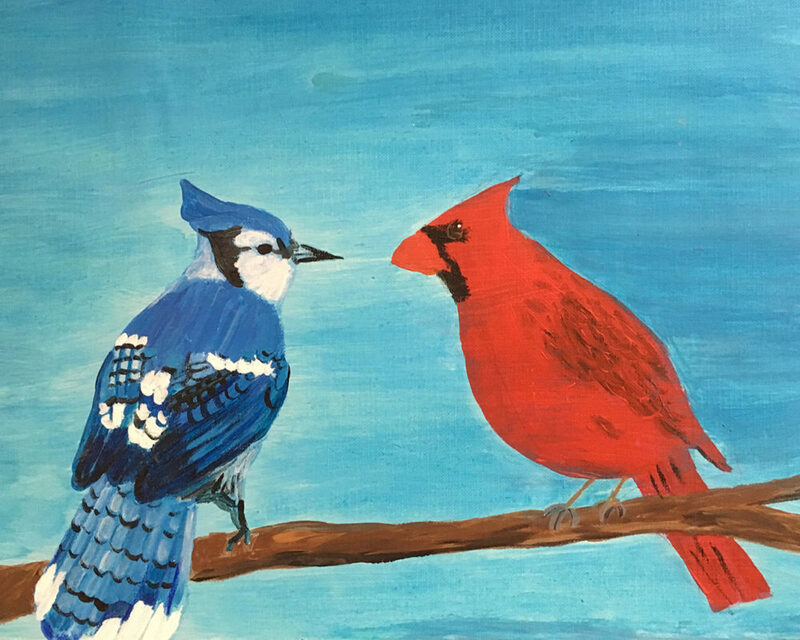 And I totally love the choice of blue jay and cardinal, seeing it as a standoff between the red and blue political poles. Being the bird nerd here *ahem*, this image is especially cool to me, because these kinds of interactions between these two species can and do take place, although maybe not as exaggerated as this. 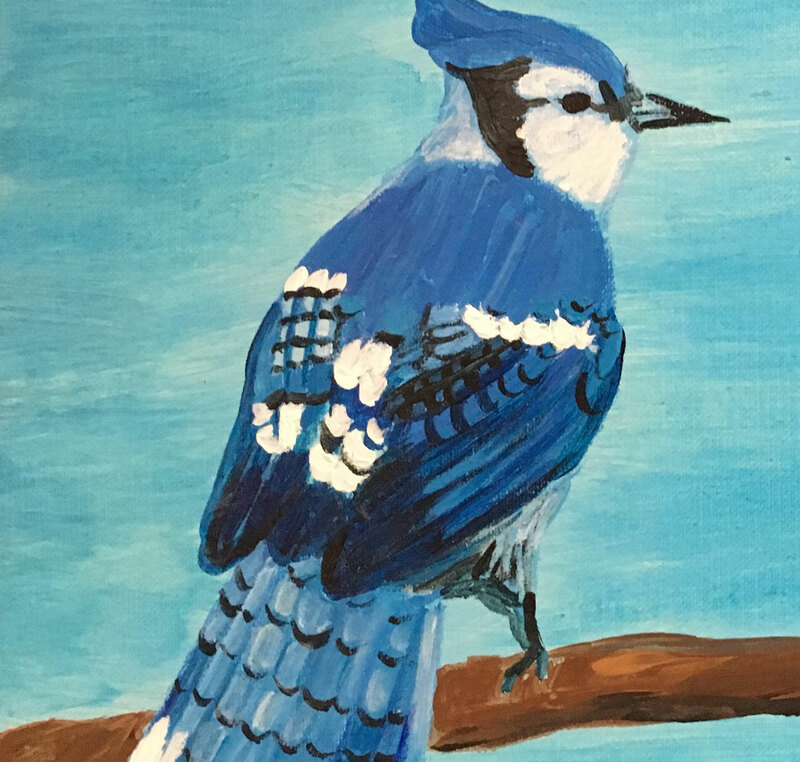 Blue jays are known as bully birds. They supposedly take over feeders and chase away smaller, more delicate birds like cardinals. 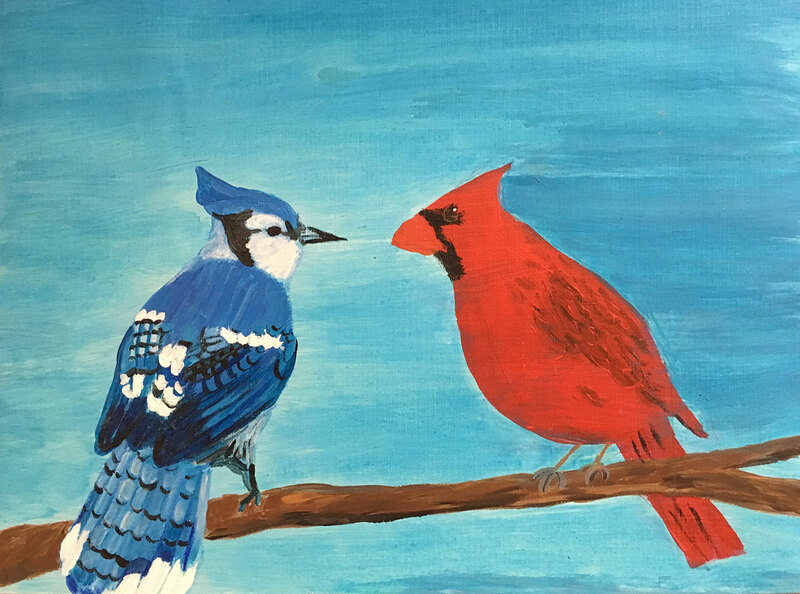 But back at home, we host a clan of thirty or so blue jays as well as a sweet cardinal couple, and they have always lived in harmony with each other. There is the occasional wary face off around a pile of seeds, but it never ends badly for either set of birds. I think our society has a lot to learn from these feathered fellows. I think it would really benefit you to depict at least a vague sense of place in your painting. One of the joys of spotting both blue jays and cardinals in the wild is that they appear as bright jewels against their surroundings. 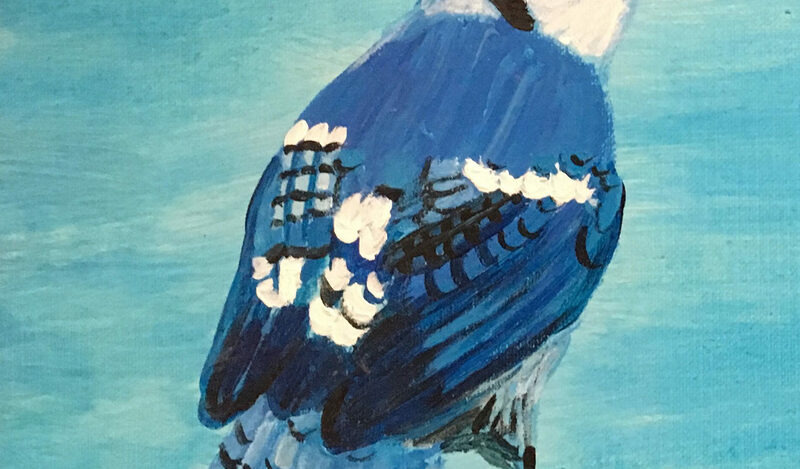 In your painting, both the blue jay and cardinal are competing with the saturated solid blue of your sky, and they shouldn’t be. An addition of desaturated foliage might set them off better, and actually might be a better middle ground. Then the red and the blue would feel more balanced. Lovely work, I’m so glad you got back into painting! Second, studying how color works in theory is a great tool to have in your palette! For example, we always start to make shadows by mixing black with the color of the form – but really, a shadows color is dependent on the color of the light! A warm light (like the sun) will make cool shadows – so with the cardinal there, the shadows should have some subtle purple, rather than simply dark red. But your application and markmaking with the brush is so lively and genuine, I’m so glad you’re picking up the easel again! 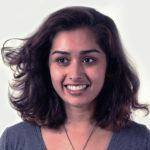 I want to see more of your work as it grows! I like the way that you have the birds facing each other; it seems like you are hinting at a specific relationship between the birds. When I think about it, this seems like an unusual situation, I don’t know tons about birds, but I feel like it would be rare to see two birds almost in each other’s faces the way they are depicted here. I would recommend that you think about ways to get your colors more adventurous and varied. 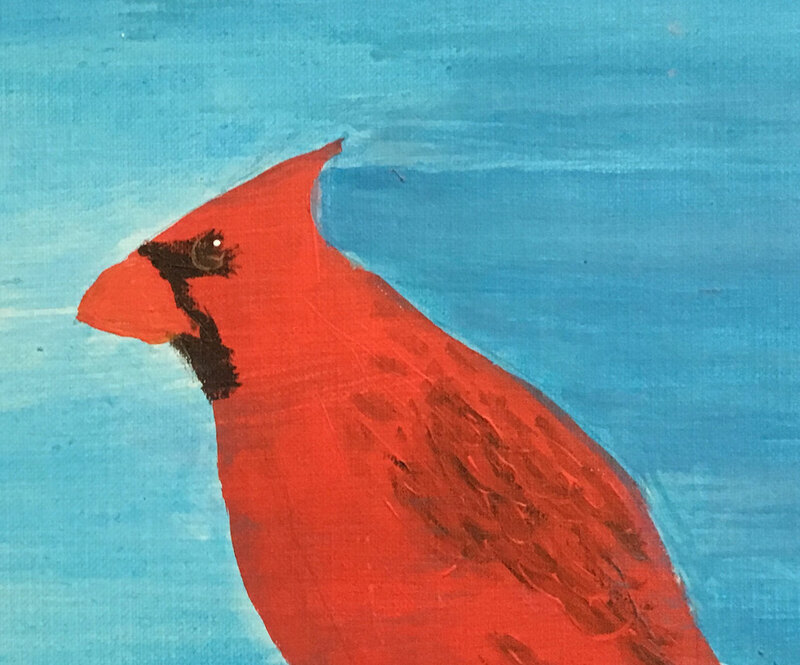 Right now the colors are quite literal: the cardinal is red, the sky is blue. However, if you look very carefully at the sky, you might notice a slight tint of purple, a moment of green. Even in a red bird, there can be shades of purples or browns embedded in the feathers. We have a Still Life course here using crayons that talks a lot about how to mix more unusual colors and layer them. Even though you are not using crayons, the fundamental ideas at the same. Keep going, it’s wonderful that you are painting again! !